Baby eats 20 000 calories a week! If your baby is a problem eater, you'll sympathize with the parents of baby Agatha Holloway. She was born prematurely and underweight which led to several near-fatal complications. Now she has to consume at least 3,000 calories a day. That's 500 more than the UK National Health Service recommends for grown men! The 16-month-old weighs only 17lb (8kg). Her diet includes porridge with thick cream for breakfast and chocolate spread on toast, followed by midmorning snacks like avocado and hummus. Lunch is usually high-fat roasted meats like duck, lamb or pork, mashed potatoes with added cream, roast vegetables in olive oil, followed by chocolate desserts and bananas. Bagels spread in full fat cheese and chocolate fingers keep the toddler going through the afternoon. In the evening she eats tuna, mash with butter and baked beans followed by rice pudding and cream. A bed time snack of porridge with thick cream and custard rounds of the day's intake. Mom, Samantha, longs to feed her fruit and vegetables. "It's hard, and against your natural instincts as a mother, which is to give your child healthy food," she said. Comments for Baby eats 20 000 calories a week! 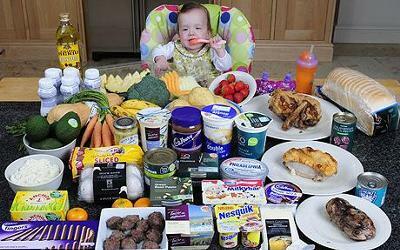 This is amazing and strange for me that a baby which 16 months old and eat 20,000 calories a week. How is that possible? Is this news true? because it's not believe able for me. Infect, a question related this news comes in my mind that such calories for a baby in a week harmful or not. any how, Actually, I like to hire cheap custom writing essay at ontimeessay.net but when i saw this news like to stop my all other working and read that news about baby.